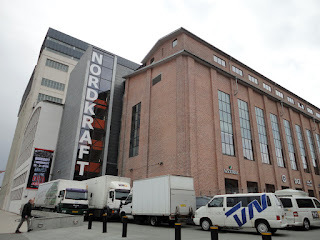 'Ordkraft' (Word Power) is a Danish literature festival of words which takes place each year in the old power station 'Nordkraft' in Aalborg – the 3rd largest city in Denmark. As the new Festival Organizer for the Doverodde Book Festival in our 4th successive year – the plan was for me (Mette-Sofie D. Ambeck) and our newly arrived Writer-in-Residence from the UK, Nancy Campbell to promote our Festival in a new area of Denmark and also to introduce current book art to new audiences, some of them probably entirely unfamiliar with it. 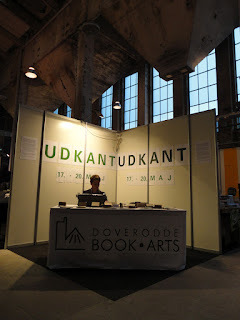 This was the second 'Ordkraft' festival and it took place in the period of April 19-21st, 2012. 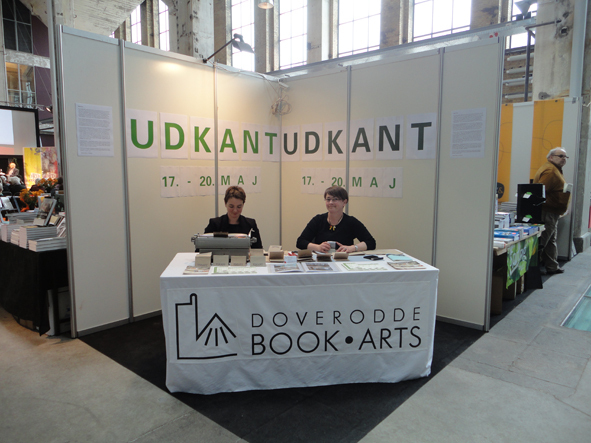 It was a curious event mixing a range of stands – mainly hosting small publishers and bookshops – with a full programme of talks by well-known Danish authors, there to present their new book releases. 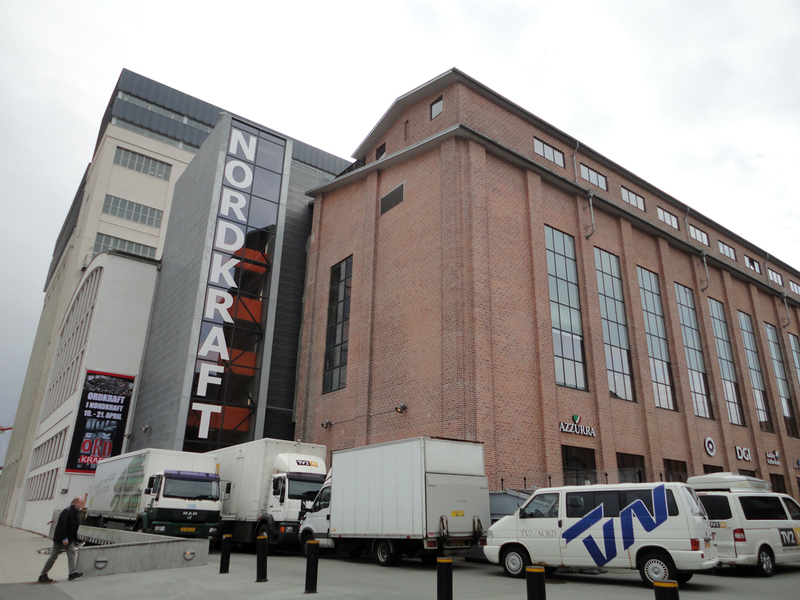 In the contemporary gallery – Kunsthal Nord – tucked away inside the imposing building, a Danish book art exhibition: 'Artist + Book' was also open, showing work by artists like Bruno Kjær, Mogens Otto Nielsen and Henrik Have, some of whom have worked within the genre since the 1970’s. While we were unfortunately placed pretty much as far as it was possible to be from the central areas of activity (ironically quite in keeping with our 2012 festival theme: ‘Udkant / On the margins’) we at least managed to spend the time wisely. 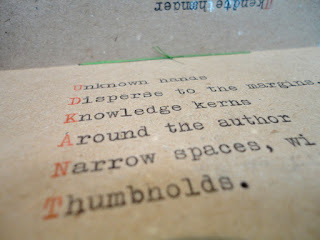 In fact we managed to produce an entirely new piece of collaborative work, created as we exhibited and combining selected materials, sewn binding techniques and written words bridging the languages of English and Danish. 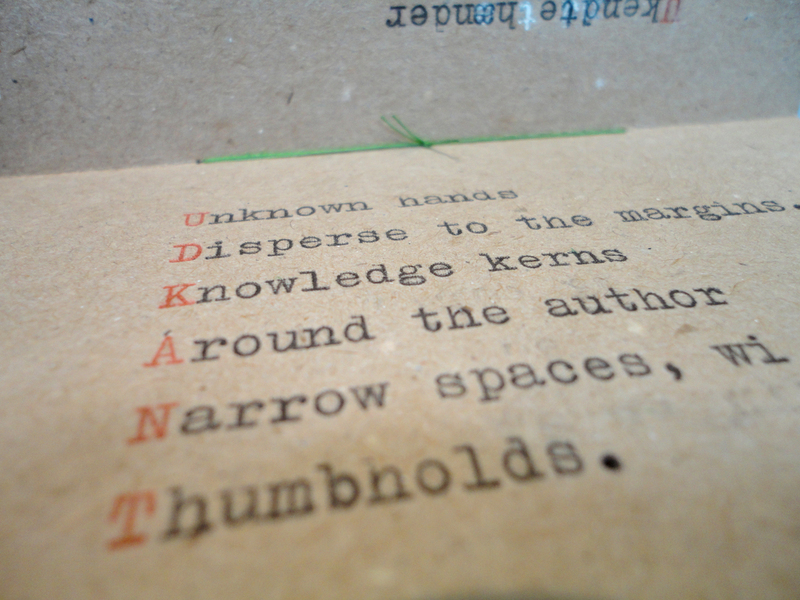 At my request Nancy had developed a new poem reflecting our theme and I then shaped this within a little 'origami' book with added pop-ups. In fact, over the days the book actually kept evolving, to the point it finally also included a Danish translation of Nancy’s poem: Udkant. 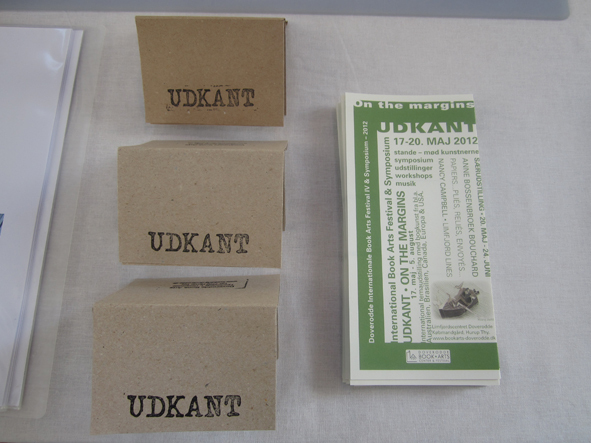 The edition was available free to anyone who came to our stand during the 3 days. 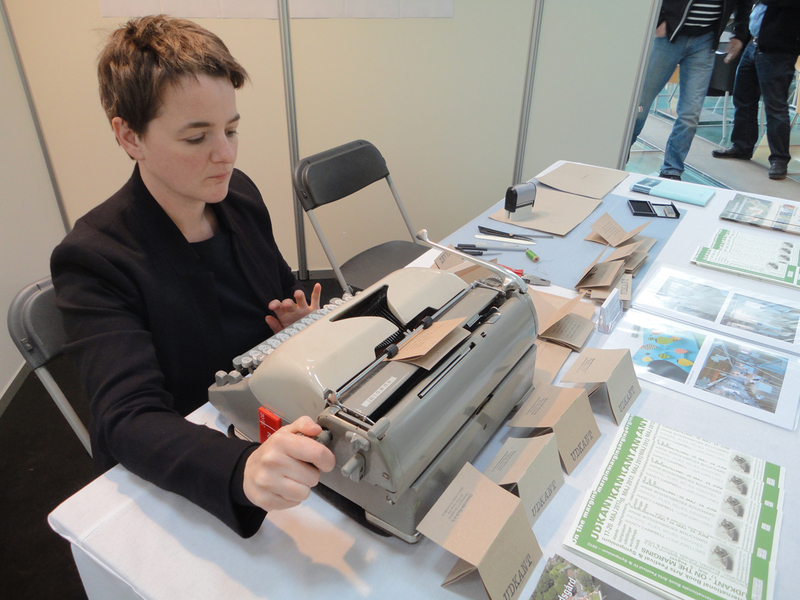 Each book was typed by Nancy on an old manual typewriter from the 1960’s (Adler–special), which brought back memories to many passers by. These included the well-known Danish author Hanne Vibeke Holst, who stopped and said: 'How wonderful to hear that sound again' and Danish journalist Leif Davidsen, was amazed is was still working, as he had traveled with many typewriters during his time as a freelance journalist in Russia. 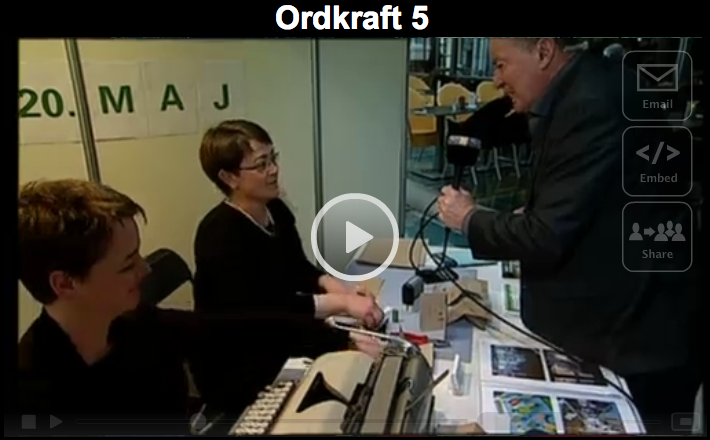 Similarly, when we were featured and interviewed by the local TV station (TV2 Nord) their reporter also got excited and asked Nancy repeatedly to type 'Try once again'. Follow link to see video and go 16 minuttes into the hour long program to find Nancy typing. For the event we had also brought a thousand flyers to spread our message.